It takes a curiously ingenious or weird take on the world to use Aussie cricketer and serial shagger Shane Warne to promote a telephone service. He’s the one accused of harassing a South African woman by sending her obscene texts while on tour. 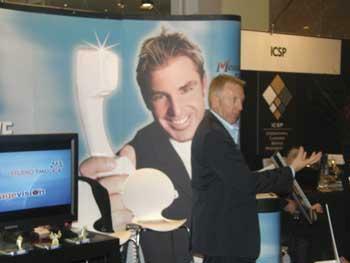 Yet an exhibition stand at the recent G-Force conference in Melbourne featured Warnie’s grinning face promoting “Messages On Hold” — verbal promotions over the phone inflicted on you as you wait to be granted some “real person” attention. The gesture of the “Messages On Hold” staffer on the stand is worthy of a speech balloon too — any suggestions? However, our e-taler reckons even this is beaten into second place by IBM’s sinister promotion for its unified communications product range. Under the caption “Take Back Control”, three smart 20-something execs are pictured enclosed in a transparent cell with a honeycomb pattern on the wall — a powerful symbol of enslavement to the corporate good, our e-taler thinks. And who has them under control? A fiftyish, balding, overweight manager poised at the terminal. Looks like a threatened man’s fantasy. As a marketing ploy we’re afraid to think it might actually work. E-tales recently got hold of a curious media release from the NZ stock exchange all about a new “gold standard of responsible investment” — an ethical Tower KiwiSaver fund that has signed up to the “un-protocol on Responsible Investment”. Obviously, someone forgot to cap-up UN (for United Nations) and the result makes for curious reading. But, a “gold standard” investment? Get your capitals right, Tower, and we might believe you. 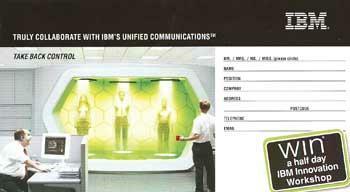 As far as E-tales is concerned, IBM’s weird green “people box” (above) is strangely reminiscent of the Star Trek transporter box — and also in tune with the recent news that the Star Trek warp drive technology could be possible. Two US physicists, from Texas’ Baylor University, Dr Gerald Cleaver and Richard Obousy, say it’s possible to warp time — without breaking the laws of physics — by warping space, so it shrinks ahead of a starship and expands behind it. The universe’s dark energy could be used to create this warp “bubble”, they say. Of course, there is the small matter of finding that dark energy, but maybe the giant atom-smasher that is the Large Hadron Collider, due to be switched on soon, will help sort this out. It’s one of the things the LHC high-energy physics boffins will be on the look-out for. Facebook could become hip for the older set now British great-grandmother Ivy Bean — 102 years young — has signed up. After hearing about all the online fun of the contact site, from staff at her Yorkshire care home, she got them to set here up with her own Facebook profile and is now tapping away to family and friends. She’s up to nine friends already and is now planning to add in her photos. After that, she plans to have a go at Nintendo’s Wii. This is spooky. Arizona pastor Irwin Alton has gone all digital and hooked into MySpace to discover his parishioners’ sins. He then castigates those poor lambs who have strayed from the narrow way, from the pulpit. He doesn’t actually name them — just their sins. One poor chap thought the Holy Spirit had gotten into the pastor — it hadn’t, he’d just been reading the man’s blog. E-tales has always had doubts about the wisdom of posting too much personal stuff online — and the techie pulpit-pontificator just feeds the paranoia. You know: just because you’re paranoid doesn’t mean the God police aren’t out to get you.